Wellfie Wednesday Tip #141: Start a Vegetable Garden! Happy Wellfie Wednesday! Welcome back! This week is brought to you by Patrick (@TheFuelPhysio). Man this weather has been crazy!! I think I’ve been fooled by Mother Nature at least 4 times this season. Every time I think Spring has come and warmer weather is here to stay, temperatures drop again! Happening again right now after the beautiful weekend we just had in upstate South Carolina. But I certainly took advantage of those nice couple days. Finally got our new vegetable garden built! Normally I would have liked to get the ground ready and prepped prior to planting some things, but I went ahead and did it all at once while I had the time to do so. This year I went with trying out a raised garden bed, where I could control all the soil and compost being used. Also testing out the location of it, prior to making it any bigger. I’ve situated it on the side of our house, where it gets morning sun and than shade from about 1-2PM onward. So far, I’ve planted some bell peppers, jalapeño peppers, banana peppers, roma tomatoes, and strawberries (not in this picture). I’ll add zucchini this coming weekend. It’s a bit smaller than my previous vegetable garden, but you have to start somewhere. The picture of the fenced in garden was at our old place back in 2017. That one was pretty successful back then, so I’m hoping for a similar harvest this year. Personally, I think EVERYONE should try out having a vegetable garden! Especially if you have young kids. Being able to teach them how things grow and where real food comes from is tremendously important. Now it doesn’t have to be as elaborate as these or other gardens you may have seen. I’ve literally done vegetable gardens in multiple gallon pots. If anything, just try out having 1 plant this year. Give it a try and let us know how it goes! Thanks for all of the support, be sure to post your pictures this week and tag the WW crew members in your post (@TheFuelPhysio, @Eric_in_AmERICa, @FreestylePhysio, @DianaKlatt) and keep the wave of healthy change going! Happy Wellfie Wednesday! Welcome back! This week is brought to you by Patrick (@TheFuelPhysio). And I've got gardening on the mind! Not because I'm busy tending to garden, but because I'm getting bombarded at work with folks bringing in all their EXTRA vegetables. It's around this time of the year (if I didn't plant) that I start to regret not having planted any veggies, and wishing I was reaping the benefits of saving a few bucks and having the freshest of foods. Last year's garden was great. We had picked a small area of the yard, 8'x8', and planted a variety of things. We had some peppers (always the easiest if starting out), tomatoes (I always have better luck with roma), eggplant (surprising easy and delicious), brussels sprouts (never knew when to pick them), and zucchini/squash (which grow like wild fire!). But this year, I wasn't totally ready, nor had the time to set up a new garden at our new house. Mother nature played a small role as well. But my point is, don't make excuses, you can always find a way to have a veggie garden. It doesn't have to be an elaborate, perfectly tilled landscape. It can simply be a plant within a pot. If you water it, it'll produce, most of the time. Though if you do get the feeling this time of year (probably just me), look into planting a veggie garden next spring, you won't regret it! (I normally start end of March/early April). However, I did end up last minute planting some fruit plants, which have surprising taken off. 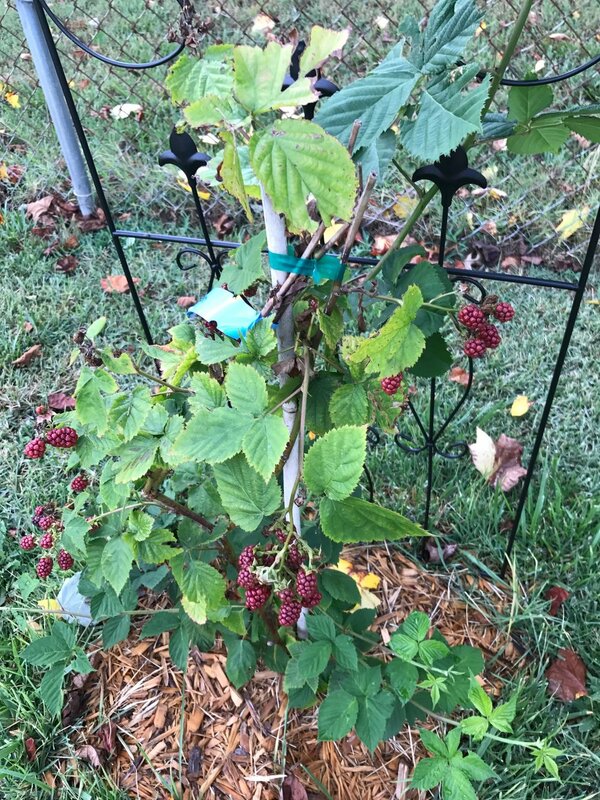 My two blackberry bushes (growing more like vines) are already producing and my two blueberry bushes are well... being bushes. Let us see your garden if you planted this year! And Thanks again for all of the #WellfieWednesday support, be sure to post your pictures this week and tag the WW crew members in your post (@TheFuelPhysio, @Eric_in_AmERICa, @AaronPerezPT, @DianaKlatt) and keep the wave of healthy change going!